(Lena Herrmann, Germany’s strongest female rock climber, is the first woman to send “Battle Cat”, an 8c+ route in the Franconian Jura. 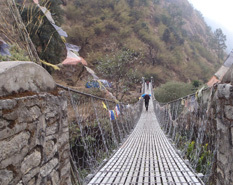 The German Alpine Club helps restore trails damaged by Nepal’s 2015 earthquake so that local communities can reconnect. 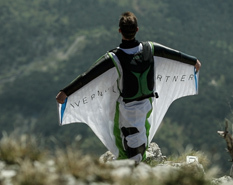 After a few years of BASE jumping, six out of a group of ten friends have met their death. The fascination and addiction of this extreme sport as well as the pain of those left behind constitute a crucial conversation. 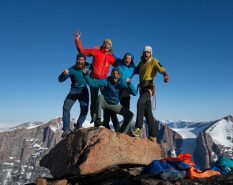 Two Belgians and three Italians set out with musical instruments and ropes to scale the 1,000 m rock walls of Great Sail Peak and the Steward Valley on Baffin Island. In 2011 Sean Villanueva O’Driscoll received the Price for a Junior Film Maker for “Vertical Sailing Greenland”. The evening’s host Michael Pause form Bavarian Public Broadcasting will welcome a number of interesting guests. 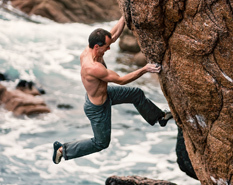 Please note: To accommodate its immense popularity, the German Alpine Club (DAV) Programme will simultaneously be screened in the Sporthalle venue, albeit it in different sequence. 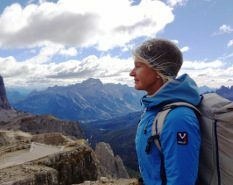 Gudrun Weikert braves a male domain and in 1988 becomes Germany’s first female mountain guide. At the peak of her career, an unplanned pregnancy unhinges her life: instead of motherly affection she feels despair and anger. To overcome her depression she must let go of extreme goal orientation. Professional freeriders Matthias “Hauni” Haunholder and Matthias Mayr strive to be the first to ski off Gora Pobeda’s peak, East Siberia’s highest mountain. They also discover pioneer communities, collective farms and a nomadic lifestyle defined by severe cold and outstanding beauty. Bizarre sandstone towers rise from lush green jungles in China’s first and largest national park. 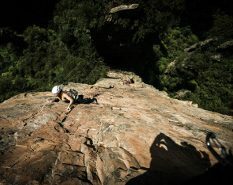 In 2016, Mayan Smith-Gobat, Ben Rueck, Liu Yongbang and Xiao Ting are the first climbers permitted to try their skills here. 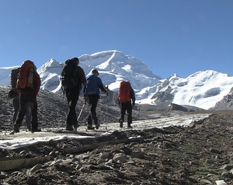 Only one out of a group of five mountaineers survives a tragic avalanche accident on the Tibetan eightthousander. Between contradictory versions of the event, questions abound. Dave MacLeod discovers the joys of opening new routes in scenic places from the Scottish Highlands to the Isle of Mull. Snow cannons, mini dirndls, mountain car racing. 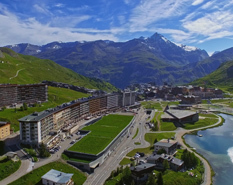 Tourism managers keep industrialising the Alps with entertainment opportunities while environmentalists cry for a stop to the craze. 8k Ascensions are as common as the environment’s deterioration, egotism and economic strife. 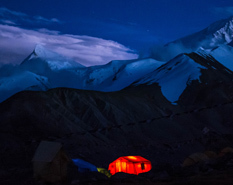 This film accompanies a common, drama-free ascension of Cho Oyu (8,201 m), taking us from the Chinese drivers’ camp at 4,500 m to the peak. Till Gottbrath has crossed frozen lakes by bike, the Greenland ice sheet on foot and sailed rough oceans. 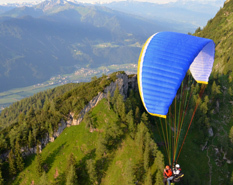 His paraglider guarantees aerial adventures in the tame Brandenburg Alps. A Qatari family of six hopes to utilise their Mt. 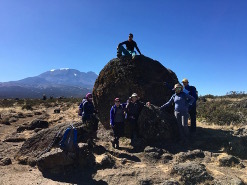 Kilimanjaro climb as a bonding opportunity. However, extreme physical and mental challenges push each family member to their outer limit. According to minstrel legends, a dwarf king named Laurin ruled over the beautiful Rosengarten mountain range and his rose garden is what illuminates as Alpenglow during sunset. Many more fantastic discoveries await visitors of this mountain rock fortress. 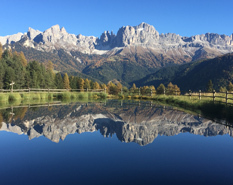 For many centuries, the inhabitants of remote mountain valleys in the Alps had to rely on nature’s healing powers and were familiar with herbal remedies. 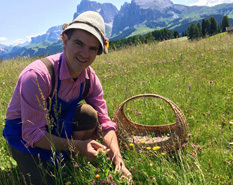 Today, the curative herbs of the Alps are being rediscovered. Two Belgians and three Italians set out with musical instruments and ropes to scale the 1,000 m rock walls of Great Sail Peak and the Steward Valley on Baffin Island. In 2011 Sean Villanueva O’Driscoll received the Price for a Junior Film Maker for “Vertical Sailing Greenland”. 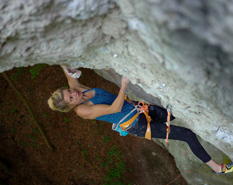 Lena Herrmann, Germany’s strongest female rock climber, is the first woman to send “Battle Cat”, an 8c+ route in the Franconian Jura.